First, I need to start with a disclaimer here. 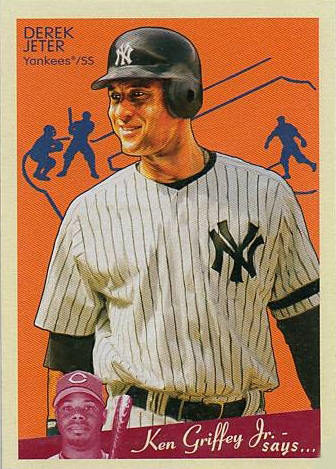 Derek Jeter has a strong relationship with Upper Deck, and is a class act. He was gracious, warm and friendly to the winners of our Yankee Stadium Legacy contest a few months back, answered tons of questions for kids on UpperDeckU, and all our internal staff who met him had nothing but great things to say about his personality when they returned from the event. He is one of the best players from this generation and has kept himself away from the off-field controversies that plagued so many of his contemporaries. His career numbers at shortstop put him among the best at all time at his position, making him an easy first ballot Hall of Famer. Fifty years from now, he’ll still be talked about by fans. He’s having one of his best seasons yet, and is an integral part of the Yankees dominance over the league during the regular season so far. All this being said, in my own humble opinion, he is not the 2009 AL MVP (despite some arguments I’ve seen to the contrary). He can’t be the MVP, because what Joe Mauer is doing right now is more appropriate for a video game with the difficulty turned to “Easy” than reality. He’s currently leading the American League in average, on-base percentage, and slugging. To reiterate, in the American League this season, Joe Mauer is simultaneously the best at getting hits, the best at getting on base, and the best at hitting for power. This is an incredible feat. Even more impressive? He’s doing it while catching, which is by far the hardest position to play in baseball. By all accounts, Mauer handles his pitching staff very well, and is an asset behind the plate. Combine with his offense, and you’ve got the most valuable player in the league. Not even close. This is not to take anything away from Jeter. He’s having one of the best seasons of his career at 35. He’s the catalyst for an offense that gives opposing pitchers nightmares. He’s hitting for a high average, taking plenty of walks, hitting for some power, and stealing bases while playing improved defense at a premium position. In any other year, he’d be MVP. In fact, in a similar 2006 campaign, he probably should have been MVP: that honor went to Justin Morneau for reasons that still puzzle me today (sure he had a great season, but not nearly the best). Actually, I take that back a bit. Morneau won the award, in part, because writers felt the Twins couldn’t have made the playoffs without him. Hence, he was the “most valuable” player in the league. Sorry, but this is crazy. In 2006, it wasn’t Jeter’s fault that he was surrounded by good hitters, while Morneau was the only power hitter on his team. Morneau’s MVP seemed to speak more to the weakness of the Twins compared to the strength of the Yankees. And to that point, in 2009, Joe Mauer has no control over the players the Minnesota Twins sign to play for the team. He can’t make decisions about which pitchers to trade for or sign, or which batters will surround him. That’s the General Manager’s job, and it’s miles away from his responsibilities. Joe Mauer is paid to catch and hit, and he’s done his job at a historical level of excellence this year. To discredit Mauer’s MVP credentials based on the performance of players around him defies logic. With this type of voter, it’s as if a player needs to find the right balance between playing on a team with just enough talent to get to the playoffs with his help, while avoiding being on a team that would have been good enough to get there without him. External circumstances out of the player’s control shouldn’t be incorporated into the decision here; and at the end of the day, I’m confident they won’t be. Some writers may still vote along these lines, but it’s hard to ignore any player putting up the performance Mauer has this year, much less at catcher. And as for Jeter? He’ll probably get another second place finish in the voting (to go along with the one that probably should have been an MVP campaign in 2006). He’ll definitely go to the playoffs, he’s the face of a franchise that is the most famous in the world, and he has four more championship rings than Joe Mauer does. So let’s not give him an MVP as a “lifetime achievement award” (as Allen Barra suggested in the Wall Street Journal). If anything, it does a disservice to his genuine career accomplishments, of which there are plenty. What they need to do is rename the award to some kind of a “best player” award rather than this “most valuable” baloney. Who is “more valuable” is so much more subjective, and it would take into account things that are not in control of the player. Does it mean Mauer is more valuable to the Twins than Jeter is to the Yankees? Does it mean that Mauer is more valuable to the Twins than Jeter would be to the Twins? Does it mean that Mauer would be more valuable to the Yankees than Jeter is to the Yankees? There’s no definition of most valuable and no standards associated with the voting. The Twins are barely a .500 team so there’s definitely an argument that can be made that Jeter is more responsible for the Yankees being 40 games over .500 than Mauer is for the Twins being two games over .500. There’s also an argument in Mauer’s favor going the other way instead. But because MLB stupidly and stubbornly insists on such a vague application of its most presitigious individual award, it ends up doing nothing but devaluing the award itself. The fact that this is even being discussed among baseball circles is ridiculous. Mauer leads the league in EVERY meaningful category and deserves to be the MVP hands down. They say that Jeter deserves to win because he hasnt before, im sure even he disagrees with that. Mauer has 160 points in OPS alone on Jeter, and as Toby said, is doing it as a catcher. As for the previous commenter, there actually is a stat that shows a player’s value in baseball, multiple stats to be exact. The first VORP, or value over replacement player, which is usually deemed the benchmark for players’ value to their team. In that category, Mauer is blowing everyone away, Jeter isnt top 10. In WARP, which is wins above replacement player, mauer is again ahead by a mile. When you think of win share percentage, or the amount of times a player contributes to a win for their team, mauer has such astronomical stats it isnt even a contest. Jeter is having a good season, no doubt, but the fact that he is competing with Mauer is against everything baseball stands for. Mauer’s season is one of the best EVER, not just this year. That says something. Since I know that someone is going to come on here and say that the Yankees have the best record in baseball, look who Jeter is playing with, versus who Mauer plays with. MVP is for most valuable PLAYER not most valuable TEAM. Jeter is not the only Yankee. Derek Jeter deserves to win, the twins already stole one mvp away from him, they better not steal another one! Jeter lead his team to the world series! Jeter swept mauer on the 1st round of the playpoffs! It’s seriously crazy that Mauer is still even being considered and or talked as a candidate for AL MVP. Where has Mauer been the last month?? ?……playing golf! OK, so I’ve read all the comments, and here’s the bottom line…Derek Jeter is BY FAR the MOST “VALUABLE” PLAYER on anyone’s roster in MLB, period! He does everything for his team…he consistently has the most Plate Appearances in Baseball year-in, year-out, he’s the CATALYST of his team’s offense…he’s the “CAPTAIN”…and he LEADS every day, period, by example, both on and off the field. He’s the quintessential professional, and he had a truly remarkable season. Had it not been for Matsui’s explosion in WS Game-# 6, one could easily see Jeter as the Series MVP. He was and is the AL MVP, not because of numbers (which are remarkable for a Shortstop, BTW), but because without him in the lineup daily, the Yankees do NOT win the AL East, do not clinch home field advantage (which proved a very important reason *WHY* they won it all this year), and likely win 10-15 less games…which could’ve knocked them out of the playoffs altogether. 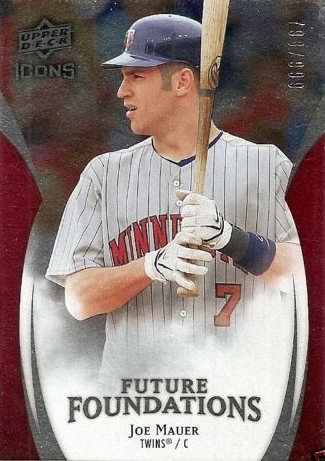 Joe Mauer *IS* a tremendous player, and was the MVP of a barely .500 team that got hot AND lucky by Detroit going into a 2-week funk that cost them the Central Division. Had Detroit won, would we be arguing Cabrera vs. Jeter? Hmmmm…I wonder. Point is, that Captain Clutch *WAS* clutch all season, and was the main reason WHY the Yankees won it all. With that as an argument, which to me is the very essence of being the most “valuable” (making your team into a CHAMPION), hands down it’s Derek Jeter…enough said! P.S…I believe someone else said it…but in crunch time “head-to-head”, it was JETER who outshined MAUER in the ALDS…case in point!